Instead of flying, many tourists choose to visit the island Aruba by cruise ship. When it comes to cruises to Aruba, there are many possibilities to choose from as they vary greatly in duration, itineraries, ports of call and price. However, finding the right cruise at the right price has never been easier thanks to major travel websites such as Expedia Cruises . Sites like these make it really easy to compare prices between cruise lines and find the best deals on the web. Major cruise lines such as Carnival, Princess, Royal Caribbean, Celebrity and Holland America Line offer cruises to Aruba year-round as the weather in Aruba is fairly constant. Most cruises range from 7 to 21 nights on average, although some companies offer cruises that can last up to 100 days! 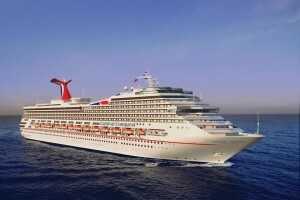 In general, the rule applies that the longer and more expensive the cruise is, the older the average passenger will be. From a value for money perspective, the best time to go on an Aruba cruise is in the months of January through March – during the island’s high season – as this tends to be the busiest booking season. In this time of year, cruise lines make over a third of their annual sales and major travel websites such as Expedia often offer incredible Caribbean cruise deals with discounts that can run up to 75% or more, especially on last-minute cruises. Several cruise lines often offer a discount on cruise fares for the second guest when booking an oceanview stateroom or higher. As you can see in the chart below, the number of cruises to Aruba have definitely been on the rise since the 1980s. In 2015, there were nearly 300 cruise ships arriving at the island, carrying over 600.000 passengers. 2013 was a record year, with nearly 700.000 passengers and over 350 cruise ships arriving at the Aruba Cruise Terminal. 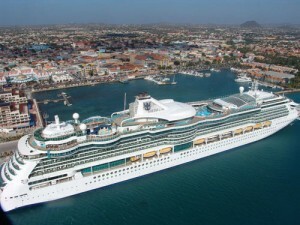 Aruba’s port and the Aruba Cruise Terminal are located in the historic capital of Oranjestad. When the cruise ship finally anchors, usually early in the morning, you’ll be happy to have the entire day to explore the island or go for one of many interesting shore excursions. Most ships leave the port of Oranjestad Aruba at the end of the afternoon or later at night around 22.00 PM. Several attractions and things to do are within walking distance so once you get off your ship, you’ll be in the middle of the action within minutes. Once you’re ready to have explored or to have finished your tours on the island, you can take a quick dip and go snorkeling for example in the blue southern Caribbean sea to spot beautiful tropical fish or relax on a picture-perfect, with all its beauty and white sands, world-class beaches such as Eagle Beach or Palm Beach. Or you can take a southern route and visit Baby Beach, a tranquil cove just outside of San Nicolas where the water is less than five feet deep for quite a distance until you reach the coral reefs. A perfect spot to go snorkeling! You can also head straight to some of the top shops in Oranjestad to buy some diamond for your dollar, fresh tropical fruits, locally made aloe vera products or some famous Dutch Delftware at one of the outdoor markets. And if you are feeling lucky, why not place some bets in one of the best casinos in Aruba while you’re enjoying your free drink? If you feel like getting a bit more cultural and shoot some amazing pictures to show to your friends and family once you get back home, you can rent a car and explore the northeast coast of this wonderful Caribbean island with its rougher yet more secluded beaches. Or visit landmarks such as the California Lighthouse, the Old Dutch Windmill or Arikok National Park. Whatever you decide to do on the Happy Island in the Caribbean, you’ll have a great time.